My mission this week is to complete 10 New York Beauty Blocks for the 2007 raffle quilt. I have had 2 months to work on this, but the adreneline junkie that I am refused to work on them until now, when I have only 1 week to finish them! 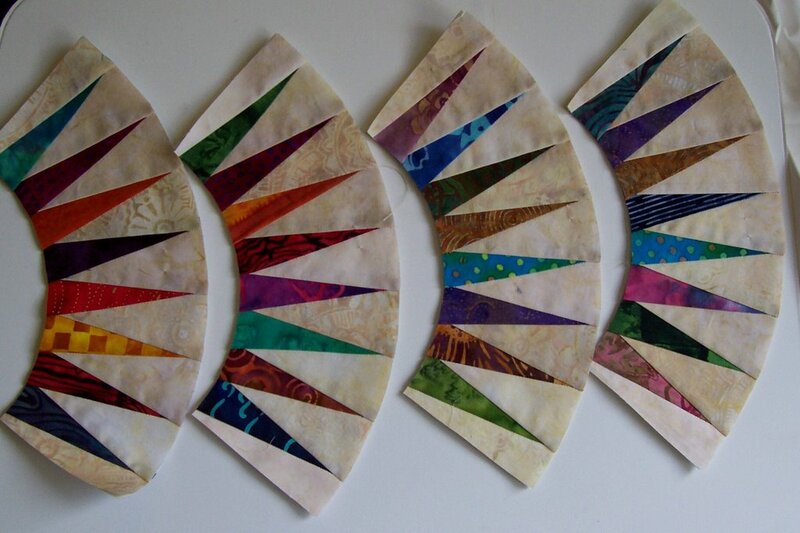 So far I have half of the arcs pieced so I am doing well. My plan is to finish the remaining 5 arcs today, sew all the background pieces on Wednesday, the 1 inch arc sections on thurs, and the small center pie sections on Fri. Then I can take them to Toni on Saturday. They are coming out very well so far - of course the batiks are beautiful. 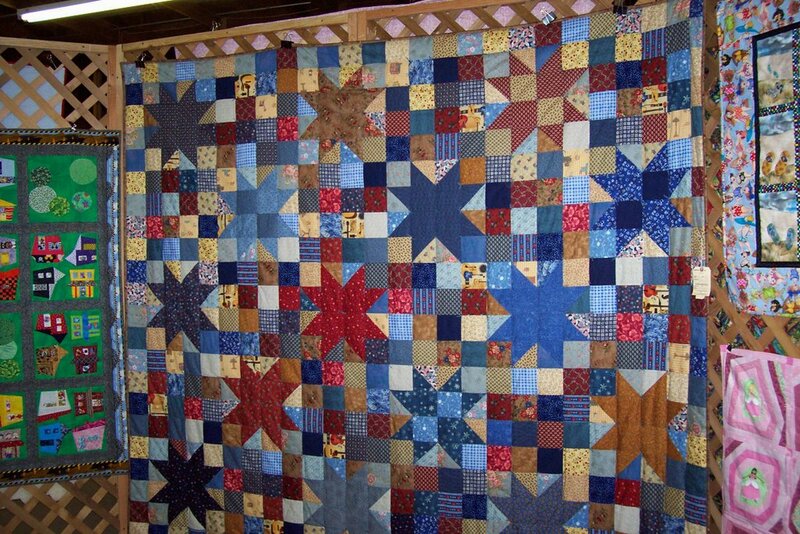 This is going to be a very colorful quilt, and I am sure we will sell lots of raffle tickets for this one! I was excited to have someone buy Nova Nouvelle yesterday! I hope the quilt brings her a lot of joy. 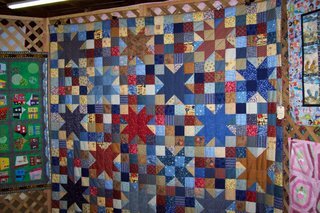 It is a beautiful quilt and I am happy for it to go to a new home. Now I really can make a new one with a clear conscience! Now to figure out colors - maybe some nice blues and purples. Last but not least, I mailed out my entry for the Pacific International Quilt Festival today! In one month I will know. In the meantime I am going to try to forget about it and just stay busy sewing. I have some curtains to work on this week, and a couple of items to be mended. Not to mention the tote bags I have been creating - more on those later! This is the last of the fair entries: Morning Glory. It got a a red ribbon. The judge wrote very nice comments, but nothing about the pucker on the back! I feel like I got away with something, though I'm sure she noticed it and that is why I have a red ribbon. Next year I may have to forgo the fair, only amateurs allowed and I am going to start teaching classes. It's been a lot of fun, and a lot of people see my quilts there that don't see them other places. I'm glad our guild show allows everyone to enter! I entered 6 items in that, but I still have to quilt one, which is a queen size. I plan to get going on that next week. I'll take it in to the shop to baste, it's soo much easier on the tables than on the floor. Off to clean my sewing space, will be having company this weekend, and every surface is covered with stuff! Another second place for Nova Nouvelle in Miniature. What did I learn with this quilt? Always make sure you trim your seam allowances. I was so excited, impatient to put this together that I didn't do that. I realized after quilting that the shadows showed through and it doesn't look as finished as it should. Hopefully I will not do another quilt with this problem, but I do get in a hurry. 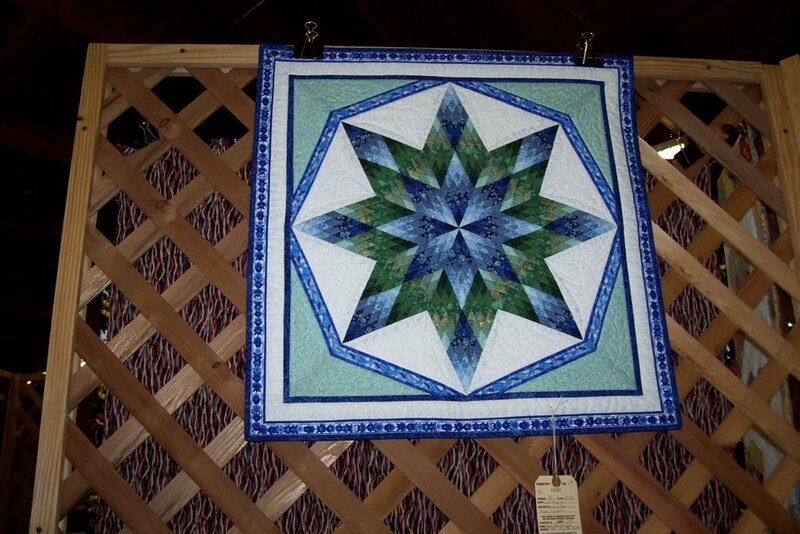 Even with this small defect, I love this quilt and think it is beautiful. 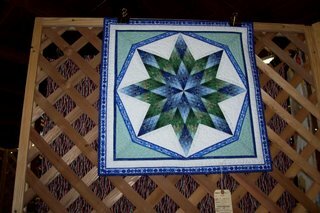 I would like to do a similar style lone star in different colors. It's amazing the effect that the color wash has on the design. I am really excited, nervous, almost nauseous today. 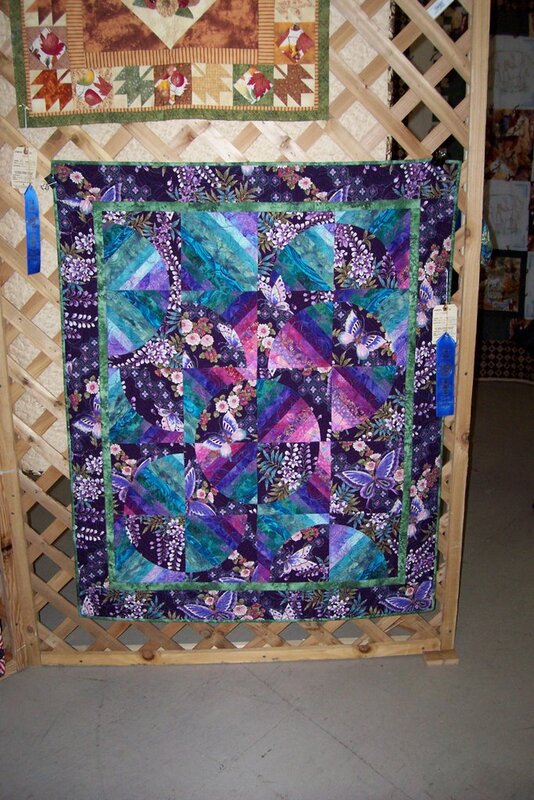 I had a picture cd made, and filled out an application for the Pacific International Quiltfest. I hope Butterfly Pond makes it in! I feel scared because I really don't want to be rejected, but I'm nervous that it will be accepted and looked at up-close and personal by the judges! I am keeping myself busy so I don't think about it too much, but I'm sure my heart rate soars every time I go there. Well, it's out of my hands now. Wish me luck, please! This is the one clothing item I entered in the fair. Every year I say I am going to enter more, but then when it comes fair time, I don't really have anything! When I made this for my daughter's halloween costume I thought that if I put it away, then it wouldn't get trashed or given away, so I could actually have something to enter in the fair. She picked out the colors and fabrics and I did all the sewing. It was not a quick and easy costume, but it did really turn out cute. She wore it to the mall costume parade and won a trophy for cutest costume! I learned a lot about working with pleather. I had to come up with a different method to make the elastic waist because I didn't have the right foot to use on it, but it came out well in the end. Though you can't see it in this picture the sleeves also have the leather eyelet trim and lacing on them. 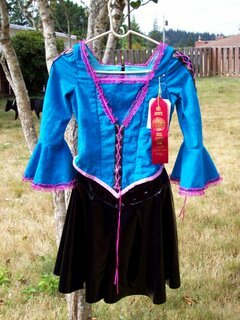 Oh, the reason I got a second place was because the neck trim wasn't even. One side comes down a little lower that the other! It's amazing the detail those judges catch! This is the comforter I made in January to keep me warm at night! It didn't get any ribbons, but I just entered it for fun. I made this all from my stash. It amounts to about 20 light fat quarters and 20 dark fat quarters for the top. I even had the backing so the only purchase I had to make was for the batting. I used 2 layers of an extra loft poly to make it really warm and fluffy. It's tied with perle cotten at the corners of the blocks. 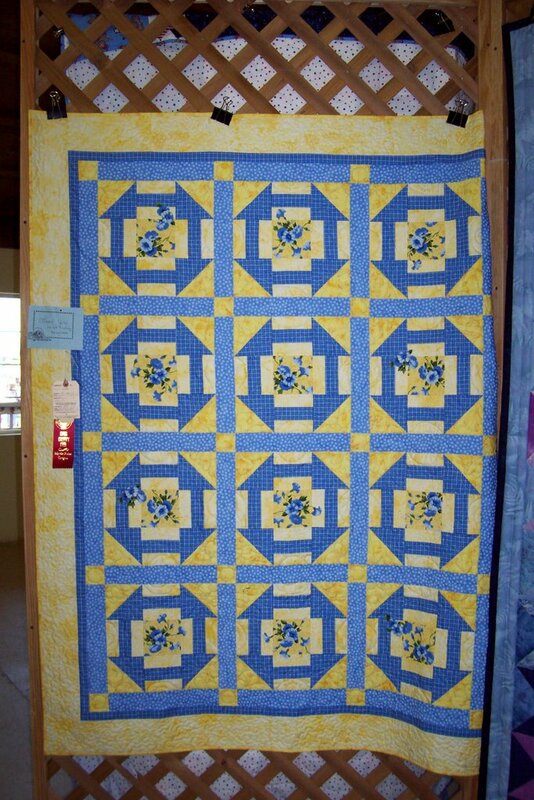 When you enter a tied quilt they look to see if the ties are all tied in the same direction. Mine weren't! I also had the comment that the ties were too tight? I can't quite figure that one out, but I like the quilt and it's really cozy on cold winter nights, so it fulfills its purpose. My other blue ribbon winner was Butterfly Pond. I got some really nice comments from the judge, so I am really happy with that! I've been using the scraps from this quilt to make some really neat postcards. 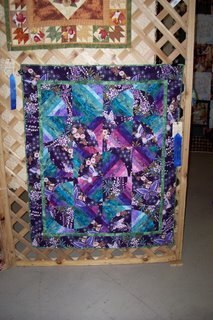 I have some for sale, just check out the quilts for sale link on the side of the page. I'm also working on a tote bag from the scraps (I had a lot of left-overs from this quilt, and they were so pretty I figured I had to make something out of them!) I got about half of it machine quilted last night, but was really struggling with thread breaking. After some internet research this morning, I think I am going to give my machine a good cleaning, check the tension settings, change the needle (yes, a novel concept for sure) and do a test run. I suspect part of it is that I am just using good old Coats and Clark thread and my Juki does regular sewing ok with it, but doesn't really like it for quilting. But, I do like the colors I have and want to finish with them. Last time I was having this trouble a good cleaning did the trick, that was just last week, though. You never can tell though. All it takes is one stray thread to throw everything off! Last week was fair week. I entered 5 quilts, and a pirate costume I made for my daughter last year. I got two blue ribbons, and two red ribbons on my quilts, and a red ribbon for the costume. 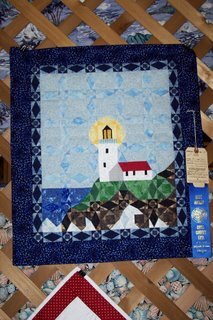 I won the special award for miniatures with my paper pieced lighthouse quilt- "A Light in the Storm" It is made from a commercial pattern, which was very nice - all of the paper piecing patterns were included, and there were a lot of them! I need to figure out how many pieces in this quilt because there are so many. I had a lot of fun making it, and decided to hand quilt it because according to the rules at last year's quilt show it was too large to be a miniature (or so I thought). According to the applications for this years show it just makes it as a miniature - yeah!! 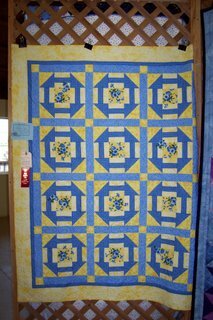 Anyway, the machine quilted category for wall-hangings is huge, but there were only a few hand quilted ones last year, so I thought by hand quilting it I would stand a better chance of winning a ribbon on it. Oh well! It won at the fair, so I hope it does well at the show in Sept. The one thing about the show is that the ribbons are awarded by public voting, so it's not always the best technical work that wins, but the most eye catching. I try to enter something in the miniatures every year - it's a small but competitive category! Plus, I just like to make them, so it gives me a good excuse to come up with yet another small quilt.